Energy Saving – Part 2. No. 2 – List the things that use electricity & estimate how much they use. Go around your house and make a list of all the things that are plugged in and using electricity. We are going to break down our total electricity consumption to help us see where we can make savings. Play particular attention to the things that are always plugged in rather than gadgets like mobiles phones, etc. 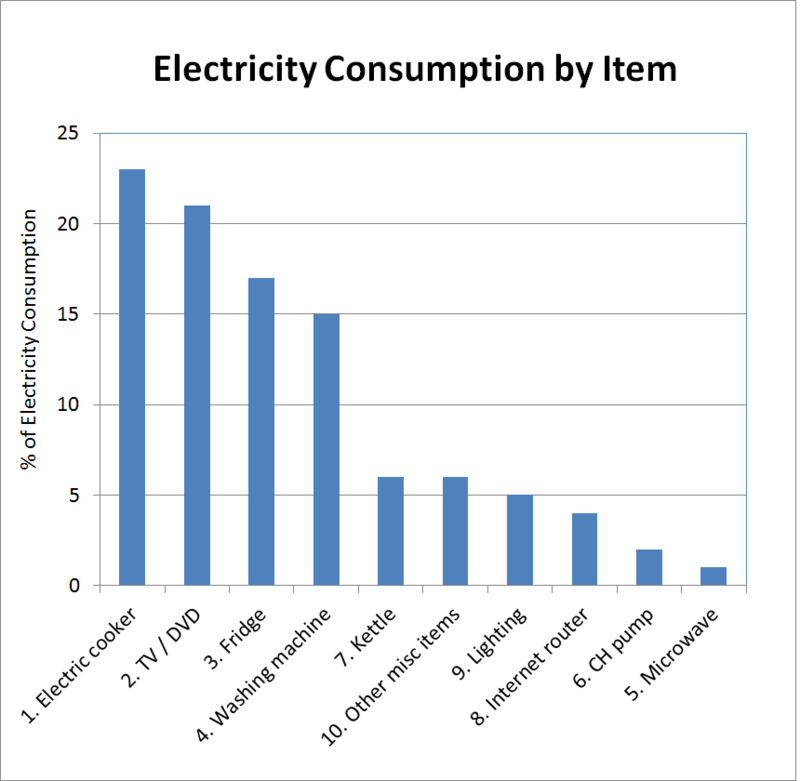 Now we need to work out the contribution of each of these items to the overall electricity consumption that we’ve been tracking in Step 1. The results for my house are shown in the chart below. Making sure that nothing is left on stand-by – especially my TV / DVD player, washing machine and microwave – switch it off at the socket. Perhaps switch to a lower RPM spin-cycle. All this stuff is pretty simple and maybe you’ve heard it before. Importantly it doesn’t involve any sacrifice on your part. You don’t have to sit in the dark, shivering to make these savings. They are pure waste. You may discover different things, for example, you may be surprised at how many things are left permanently plugged in, and you may be shocked at exactly how much your tumbled dryer costs you (when you can let at least some of the washing dry naturally). I want you to measure the consumption so you can see the impact of following advice on energy saving. I believe that the act of measurement reinforces these messages and ensures that these good acts become permanent habits. I haven’t said how I completed this analysis. I did it in 2 of ways. B. Estimating based on knowledge of voltage/current/watts and usage. More about these next time.